I freaking love this week. The busy, excited, anticipatory few days before Thanksgiving make it one of the best weeks of the year, don’t you think? I am a huge fan of anything requiring lots of organization, and so naturally, Thanksgiving dinner aligns perfectly with my type-A personality. It’s an epic meal, no matter what your traditions may be. Our family Thanksgivings tend to be on the more traditional end of things, with maybe one or two wild card dishes thrown in. But generally, we rarely stray from the usual meal. Why mess with a good thing? The sides are what totally do me in. I can’t get enough of the stuffing, butter rolls, gravy, mashed potatoes, cranberry sauce, or copious amounts of roasted or braised or mashed veggies. The turkey is great, too, but it’s definitely an afterthought for me. I’m alllll about those side carbs, baby. Oh, and the dessert. Duh. And while many people complain about them, the Thanksgiving leftovers are just as exciting to me. Not only do I adore the flavors of Thanksgiving and want to enjoy them for weeks afterward, but I also love coming up with new ways to enjoy them in the post-foodmageddon phase. Infusing them with more life, giving them a poke and a prod into something new and fun. I just love it. So, with that said, I give you this year’s Thanksgiving leftovers idea: pierogies! Guys, I am a huuuuge pierogie fan. Always have been. 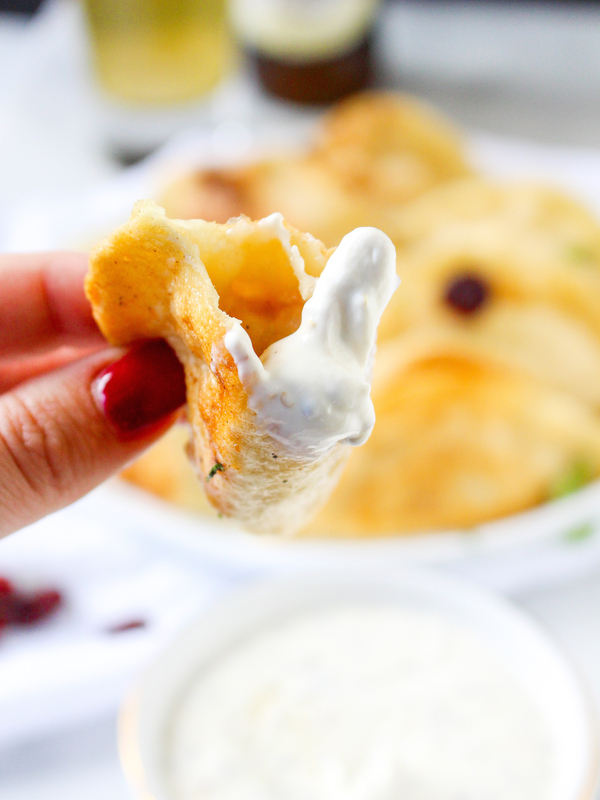 I love cheese and potato ones best, fried in butter with onions and dipped in cool, tangy sour cream. I think they may be one of the best dough-wrapped packages out there. Carbs and cheese wrapped in carbs? I mean, c’mon, it’s an obvious choice. And while I certainly don’t claim to be an expert in making them (this was my first time! ), and while I don’t have a drop of Polish blood in me, I was pleasantly surprised at how easily these came together. I gotta admit: I was certainly intimidated by the prospect of making my own pierogie dough, let alone assembling and cooking them successfully. But I think it’s safe to say that I WAS successful. Much to my joy and shock. The thing is, pierogie dough is REALLY easy to work with. Like, even easier than pizza dough. DEFINITELY easier than pastry dough or pie crust (*shudders*), which is just not my strong suit. It comes together with ingredients you likely already have on hand, requires very little work (like, 5 minutes of kneading), and is so soft and elastic and EASY to roll out. Again, I was pleasantly surprised. 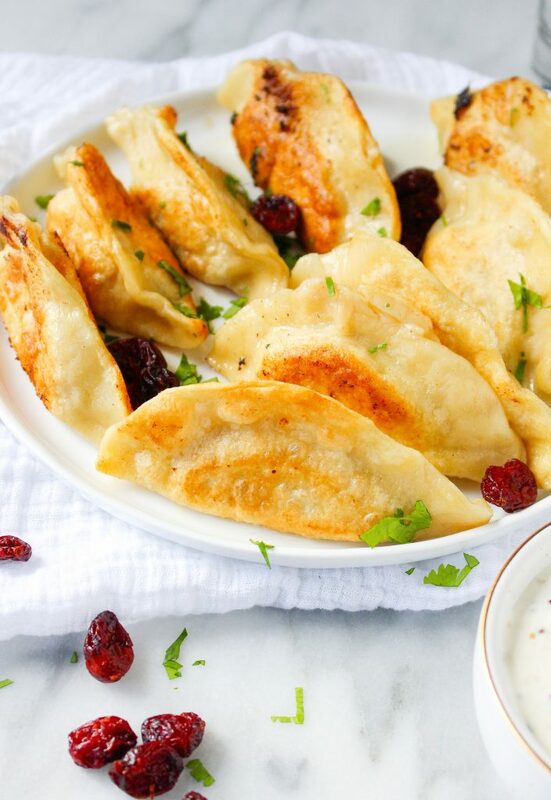 When it comes to the filling for these pierogies, you can go nuts. I went with mashed potatoes, turkey, cranberry sauce, a little onion, and cheese. But you could load these up with stuffing, mashed sweet potatoes, veggies, whatever your heart desires! Just make sure to add a little cheese to your filling for that creamy, gooey effect. It totally makes them. The filled and formed pierogies get boiled in some salted water and then crisped up in some butter. Easy peasy! I served mine with a mustard sour cream because I am a brine freak and can never get enough of that vinegary tang, especially with fried or heavier foods. 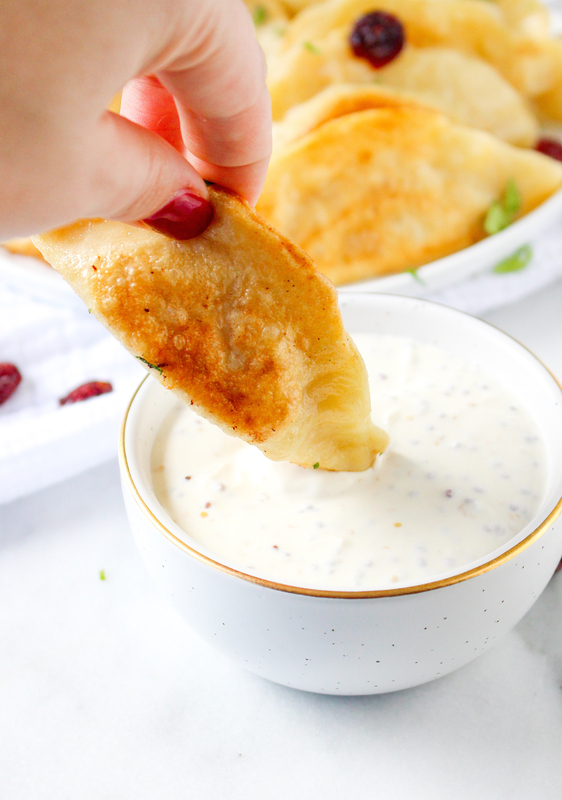 What I love most about these Thanksgiving leftovers pierogies is how unexpected they are. It’s definitely a far cry from the turkey sandwich or turkey-and-potato hash that we so often find ourselves eating on Black Friday. It’s a fun and different twist, while still tasting like Thanksgiving. Basically, it’s the best of all worlds. Mix the flour, water, egg, and salt together in a bowl until dough forms. Place the dough on a floured surface and knead until smooth, about 5 minutes. Place the dough in a lightly oiled bowl and cover. Let it rest for 30 minutes. In a bowl, mix together the potatoes, turkey, onion, cranberry sauce, and cheese until combined. Season, to taste, with salt and pepper. Whisk together the ingredients and season, to taste, with salt and pepper. Set aside until you are ready to serve. Bring a large pot of water to a boil. Set up a large skillet and add a couple tablespoons of butter. Divide the dough ball in half and roll each half out to an ⅛-inch thickness. Using a knife or biscuit cutter, cut the dough into 3-inch circles. Spoon 1 heaping teaspoon of the filling on each circle and then fold the dough in half, pinching together the edges to seal in the filling. Continue until all the pierogies have been formed. In batches, add the pierogies to the boiling water. Cook for 8 minutes. Meanwhile, turn on the heat to medium under the skillet and melt the butter. 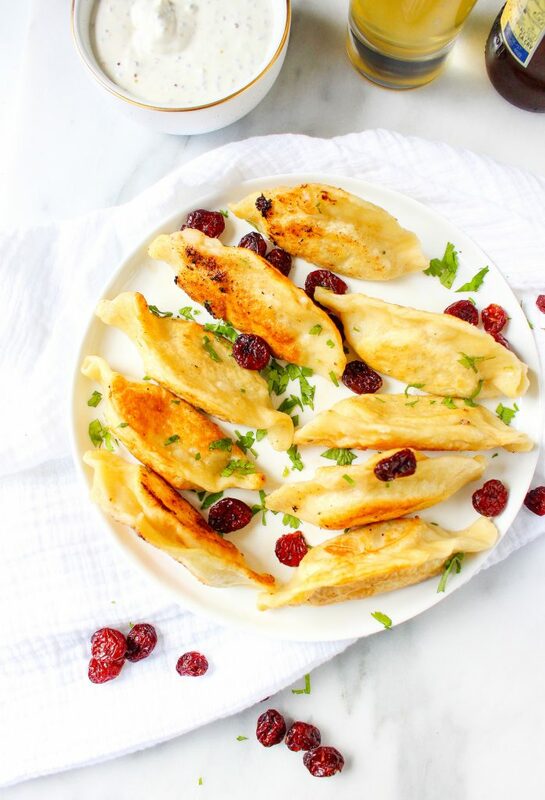 Remove the boiled pierogies from the water with a slotted spoon, allowing the excess water to drip off, and then add them to the skillet with the butter. Cook in the butter until crispy and golden, about 2-3 minutes per side. Repeat with remaining pierogies. Garnish with the dried cranberries and herbs. 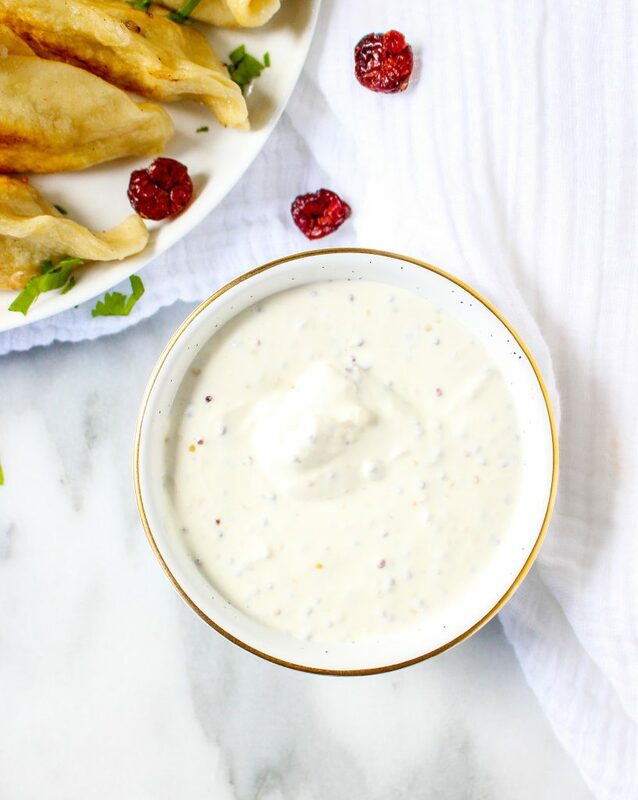 Serve warm with the dipping sauce on the side. 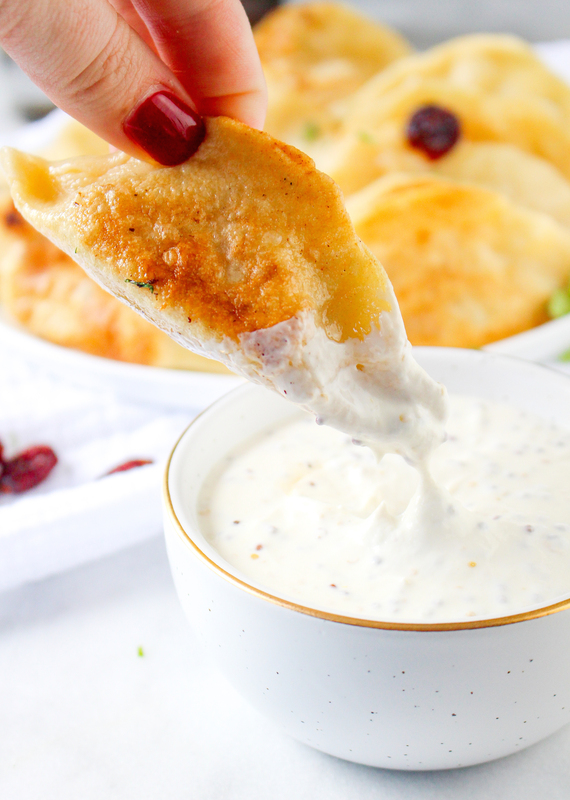 I find that these pierogies taste best if made just before eating. If you are not planning to eat them all in one sitting, store formed but unboiled pierogies in the fridge, covered well. They’ll last a day or two. Boil and fry in butter when you are ready for them. You write a bit too much when one is simply searching for a Pierogie recipe – however after a lot of scrolling, the recipe (…put up top next time) is fantastic. I really liked your recipe for Thanksgiving Leftovers Pierogies, so I posted it to my Web page on Reddit. The Web page contains a lengthy compilation of interesting food blogger recipes that I find. Michelle! Thank you! I’m so happy you enjoyed these. It makes my heart full!